For those of you keeping an eye on the South African mining strikes, you likely realize workers and mining companies came to an agreement recently. Mine workers get a raise and mining companies, like Lonmin and Impala Platinum, get to start producing again. It shouldn’t have been a surprise to see palladium and platinum trade steeply lower when news of the agreement first hit. After all, I warned about such a scenario here. In spite of a new labor deal, platinum is rising to multi-month highs. 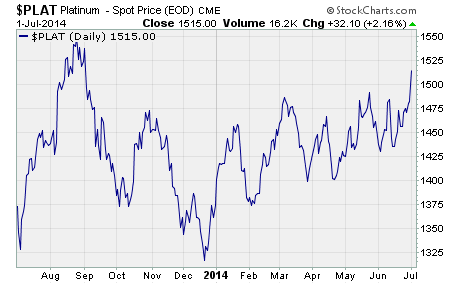 In fact, the metal broke firmly above $1,500 an ounce in yesterday’s trading session. As you can see, bulls are still in firm control of both metals. Why are platinum and palladium rising when South African production, which is the world’s largest source of the metals, about to kick into high gear again? First of all, auto sales are surging in the US, China, and European Union. As a matter of fact, US car sales for May and June came in remarkably strong. May car sales reached the highest level since 2006. And even though analysts expected weaker June results due to fewer days in the month, sales actually matched that of May. 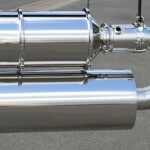 Since platinum and palladium are key ingredients in catalytic converters, which are required in every modern automobile, investors see demand picking up. Investors caught word of a new South African strike developing. Members of the 220,000 strong National Union of Metalworkers of South Africa are ready to start a strike as early as next week. While the strike won’t likely affect the platinum mining industry, it reminds investors just how fragile the labor situation is in South Africa. Some analysts believe mining companies have been suppressing the price of platinum and palladium to better their position in recent labor negotiations. Strongly higher metal prices would have helped mine workers’ case for better wages. Now that the negotiations are over, prices are free to rise. 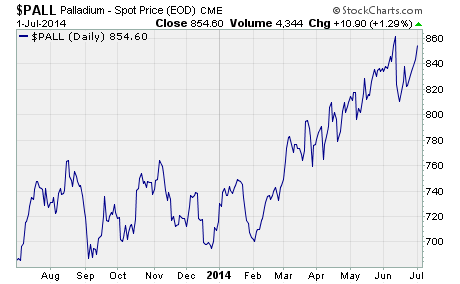 Just how high can platinum and palladium go? Given the severity of yesterday’s bullish platinum breakout, the metal will likely hit $1,550 an ounce in the near future. After that technical milestone is surpassed, we may see a continued rally to the $1,700 area. Of course, incoming economic data must remain strong for such a scenario to play out. As for palladium, $860 is the last bit of technical resistance before the metal is free to roam to the $900 area. Without question, it’s good to be a platinum and palladium bull right now! ***Editor’s Note*** Subscribers to my flagship commodity ETF investing service, the Commodity ETF Alert, have been patiently long platinum and palladium ETFs since early 2013. 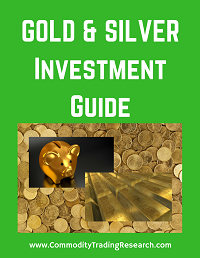 If you’d like to discover how to get into the right commodity ETF, before the price of the underlying commodity rallies higher, click here. Justin Bennett is the editor of Commodity ETF Alert, an investment advisory focused on profiting from the ebb and flow of important commodities via ETFs. The commodity veteran and options specialist is also a regular contributor to the Dynamic Wealth Report. Every week, Justin shares his thoughts with our readers on a variety of commodity-related topics. Justin is also a frequent contributor to Commodity Trading Research’s free daily e-letter. And he’s the editor of another highly successful and popular investment advisory, the Options Profit Pipeline. « Mid-Year Scorecard: Did You Catch These Top Performers?